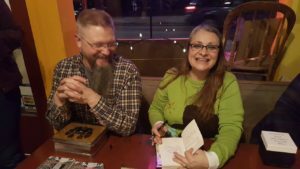 It’s taken me more than two days to process (and another two just to get this post up) what was the book launch for my debut novel, Wilderness Rim, Echo Falls, Book One. As far from where I sit, the launch went off without a hitch. I mean, there were small things I wasn’t prepared for because I’ve never done my own book launch before, like the fact that if you’re on a stage with real stage lights, it might be hard to actually do your reading because the lights can cast weird shadows on the text (oh, and maybe you need to see the eye doctor again). And that you better eat before the event because I couldn’t even settle down long enough to drink a glass of wine until it was all over. But, then the venue owners took pity on me and got me sustenance — great wine, even better food (I need that spinach enchilada recipe, stat!). But the good things far outweighed the bad things, and there were mostly good things. Those good things include the fact that it was standing-room only in the venue, The Black Dog Arts Cafe. They were gracious and had wonderful food and drinks for everyone. 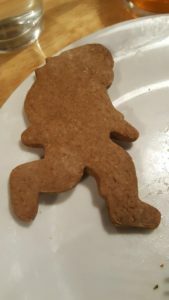 I didn’t have to bring home too many of the Sasquatch cookies that we handed out. Additionally, we sold out of the 30 books we brought with us to the launch event. I honestly had to tell people that they would have to get their books on Amazon and to look on my web site for my next reading event of Wilderness Rim to get it signed — or find me at The Black Dog on any given Friday. Yes, yes, it’s a great problem to have. 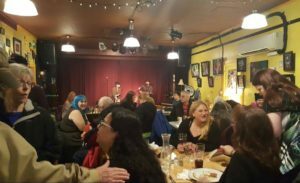 The crowd represented many aspects from my life — people who know me from my kids’ activities, other local writers — especially those who are involved with SnoValley Writes! (the writing group I formed in 2008, which is still going strong), the arts community at large, my farming friends, my activist friends, and of course, my family. I loved that I wasn’t the only one in Sasquatch Silliness Gear. 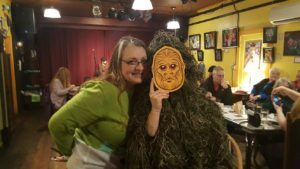 Big kudos and thanks to fellow author, Rachel Barnard for being in the Bigfoot spirit. There were people who came from all over to be there — Buckley, West Seattle — and my soul sister, Lisa, traveled all the way from Portland, just to surprise me for the night, bringing a “pamper yourself” gift for her favorite author. 😉 She made me cry and I had to chastise her for ruining my make-up. What another great problem to have. 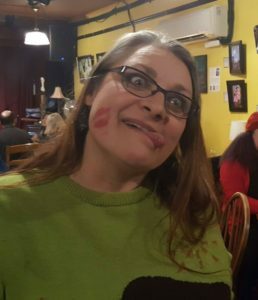 My cover artist, Leslie Moon, had art available at the event, too, and she even saw lots of love that night, people gobbled up her art as much as they gobbled up the cookies. One of the things I learned was that you’re going to forget something — even if you write it down. I had planned to reveal that there’s another fandom Easter Egg in Wilderness Rim, and that I would be running a contest here on my blog for the first fan to find it. I was going to give a hint at the launch about what fandom that is. But, I forgot. So now everyone gets an even chance and I’ll be hinting at that on the blog here in a couple of days. So, stay tuned. The creativity was so thick in the air and we launched an “I <3 Stinky” campaign that soon will be launched right here, so stay tuned. At the end of the night I was exhausted in one of the most pleasant ways anyone can — just overwhelmed with the love and support. It was a blissful, bless-full night. 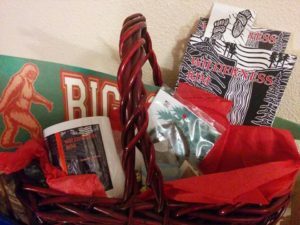 One of the members of the bluegrass band that was playing right after my event ended up winning this prize basket. Hope they love Stinky as much as I do. Thank you. Thank you. Thank you. I’ll be saying Thank you I believe until the next book launch. 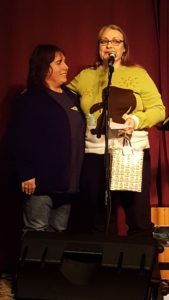 For my inaugural novel event, you all made it so wonderful. A lot of years, lots of tears, and much sweat equity went into making this event the success it was. I would be remiss if I didn’t say a special thank you to Colleen, who brought the delicious cupcakes to compliment the cookies; to Sue, who served the goodies; to Tonya, who was my prize basket drawing diva; and to Jess, Sheri, and Lisa who took photos. 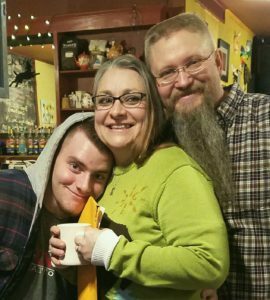 Also, to my son who provided grunt labor, and my spouse who was the money man that night: I love you both and your support Saturday was invaluable. No project like this happens by the feat of one person. So, thank you. And a hat-tip and curtsy to Cris and Greg at The Black Dog for opening their wonderful cafe to our Sasquatch Silliness and Released From Quiet for playing us in and out of the night. Going to be hard to top this with the next book, Rattlesnake Ridge in late summer, but we’ll try. Leslie Moon (L) and Yours Truly. I made her come up on stage to give her a little treat and let everyone know that she’s agreed to do cover art for the entire Echo Falls series. Woot! It was a tremendously good eve. Met some writers,laughed, saw old friends, was just so happy to see you Glow! !This is a launch among many, I am sure! It sounds like a wonderful evening! Just one thing: You might want to change “coolies” in paragraph 6 to “cookies.” I know you meant cookies, but around here, “coolie” is a denigrating racial slur. I don’t want folks getting pissed at you for no good reason. Feel free to delete this comment.